Shoulder dystocia is simply the baby getting his or her shoulders stuck in the pelvis during birth. Contributing writer Danielle tells us how it can be prevented, and what can be done during birth if it does occur. Shoulder dystocia is simply the baby getting his or her shoulders stuck in the pelvis during birth. This can happen in a number of positions, and is often because of the pubic bone. Many believe that this only happens to large babies, and while it is more likely that a big baby will get stuck, that is only 50% or less of cases. Often, it is just because of the mother and baby’s position. In the U.S., there are an estimated one birth with shoulder dystocia for every 200 births, so it is rare, and this number is much lower among midwives, birth centers, and homebirths. Unfortunately, most medical providers are only trained in correcting a shoulder dystocia at the symphysis pubis – the joint that holds the pubic bone together. However, this is just one of many areas of the pelvis where the baby can get stuck. This leads to poor shoulder dystocia outcomes in hospitals. Though some dystocias cannot be avoided, it is possible to reduce the chances that your baby will become stuck in your pelvis. Allow the mother to birth freely. Birthing mothers know the positions that their body and baby needs to deliver – hospital staff and midwives should avoid directing the mother on how to labor and deliver, barring an emergency. A mother’s body knows which positions the baby needs the mother to be in for the baby to make its needed movements through the cervix, pelvis, and birth canal. Interventions that limit or stop the mother’s ability to feel her pelvis and baby do not allow the mother to move in positions that are needed for the baby to make its turns. Many midwives believes that a forceps or other doctor-assisted delivery only serve to get the baby stuck in the pelvis. Allow yourself to birth slowly and without assistance. Pushing the baby out, especially when the head is out but not the shoulders, could lodge the baby in the pelvis without his or her ability to turn. The mother’s body will naturally eject the baby, and no pushing is needed unless there is an emergency. Again, the mother’s body knows how it needs to move and be in position for the baby’s exit. Epidurals require a mother to be lying down, which does not allow the pelvis to open properly. This greatly restricts the baby’s ability to move around the pelvis to enter the birth canal. Educate yourself on the best positions that allow baby to move, and ensure your birth provider and team will not force you into unhelpful positions. Take red raspberry leaf and evening primrose oil. Red raspberry leaf and evening primrose oil can be taken to prepare the uterus and soften the cervix for an easy delivery. Read up on Susun Weed’s Wise Woman Herbals “The Childbearing Year” to have herbals ready for birth. You can find this book used for just a few dollars, and it is the best herbal birth book I have ever read. Be aware of good pregnancy positions. During pregnancy, avoid couches and recliners, watch your posture, and do spinning babies, chiropractic, polar bear position, and forward leaning inversions. First, do not panic. Second, do not pull. Pulling can harm the baby if he or she is truly caught on a bone. Gently move the baby to see if they are simply taking their time or stuck on tissue. If it’s determined that the baby is truly stuck on a bone, then try to move the mother. Try new positions to open the pelvis, like squatting, raising legs, or on all fours. Normally, this will allow the baby to dislodge and come out easily. If this does not work, then try to move the baby. Locating the babies chest and shoulders, gently apply pressure to each side to encourage the baby to move. Between these two, with some patience, the baby will deliver. Cutting the umbilical cord if around the baby’s neck is also not a good idea. The longer the cord is intact, the longer the baby is getting oxygen and the provider has time to move the baby. In a hospital, with a woman under an epidural, doctors will usually automatically do an episiotomy, and pull out an arm, though cutting near a baby’s head is dangerous, and little research shows this truly helps mothers deliver. 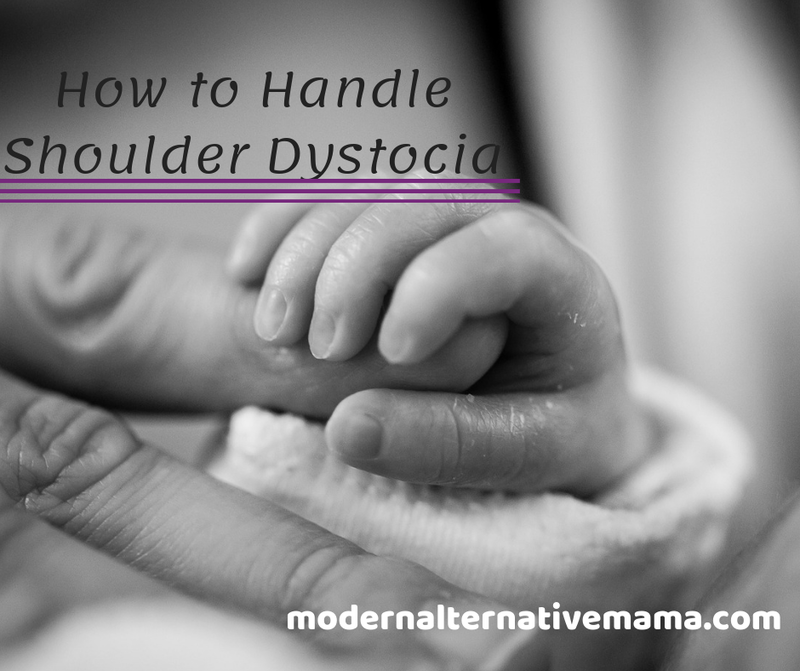 Did shoulder dystocia happen during your birth? Since I’ve had the shoulder dystocia happen once (he was a really big baby, at 10# 11 oz), that’s one more mark against me, and one more possible outcome that really terrifies the doctors. I’m hoping to find a better support system with the midwife. I know it is very controversial, but you may want to reevaluate the use of evening primrose oil, or at least put a little disclaimer. This can be a dangerous recommendation! Otherwise, enjoyed the post, and the embedded links were very helpful! I am 36ish weeks with baby #3, and attempting my first unassisted homebirth after two very unnecessary and elective C-sections. thank you for the resources!